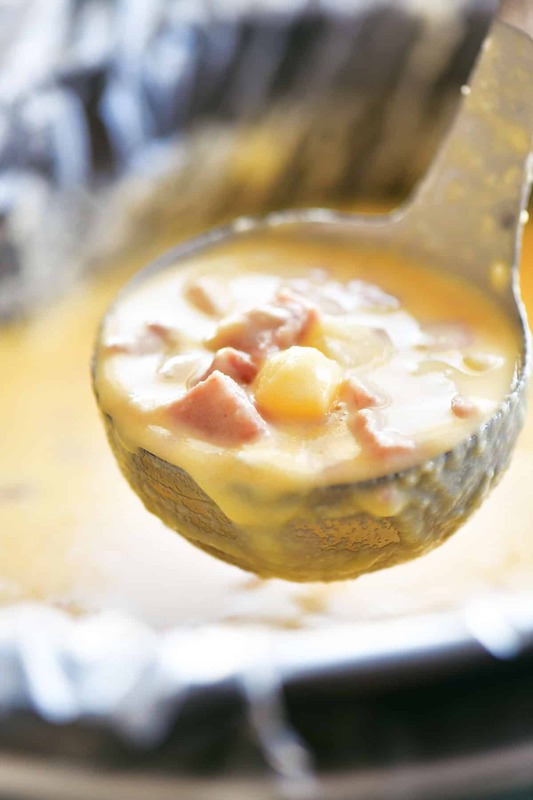 A hearty bowl of Slow Cooker Ham and Cheese Soup is the perfect way to warm up! Put it in the crockpot in the morning on a busy weekday for an easy dinner. There is something about the cold weather that makes me crave a bowl of warm, hearty soup! It’s probably because I’m looking for a way to warm up. 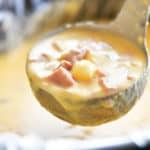 This ham and cheese soup is a family favorite and is one of the most delicious ways to use leftover ham. I make is a simple meal and serve it with dinner rolls and a salad. Where is the Slow Cooker Ham and Cheese Soup recipe? In this post, I will share step-by-step instructions with photos for how to make this soup, as well as answering FAQs about the recipe and sharing a short video showing the recipe in motion. But you can go directly to the recipe by scrolling down to the bottom of the post. Start by peeling and cutting the potatoes. To get four cups of cubed potatoes, I used four large russet potatoes. One of my favorite shortcuts is to buy cubed potatoes from the refrigerator section of the grocery store but they were completely sold out when I went grocery shopping. Next, cut up the ham. Unfortunately, I didn’t have any leftover ham to make ham and cheese soup this time so I bought a piece of cooked, sliced ham from the grocery store. It ended up working really well in this recipe. 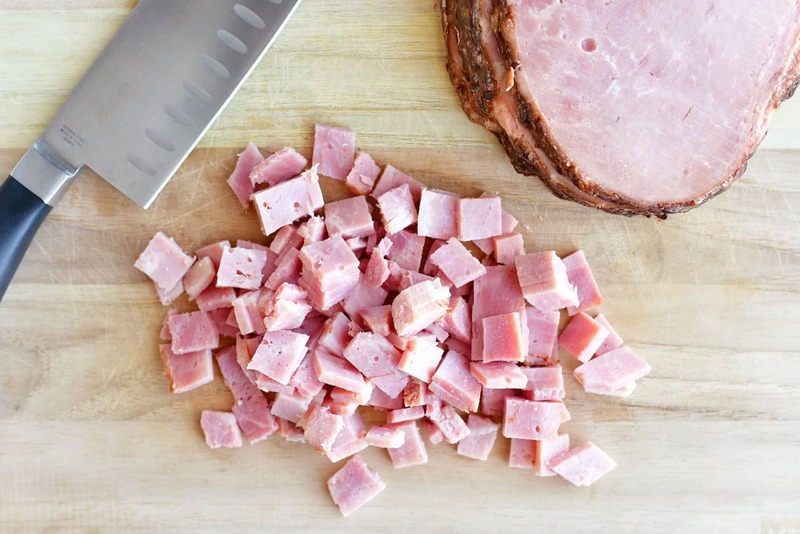 If you are using leftover ham, your pieces won’t really be cubed but it doesn’t matter. You just need them to be bite sized. Put the ham and potatoes in the slow cooker (don’t forget the crockpot liner for easy cleanup) an cook on high for 3-4 hours low for 6-8 hours, or until the potatoes are fork tender. 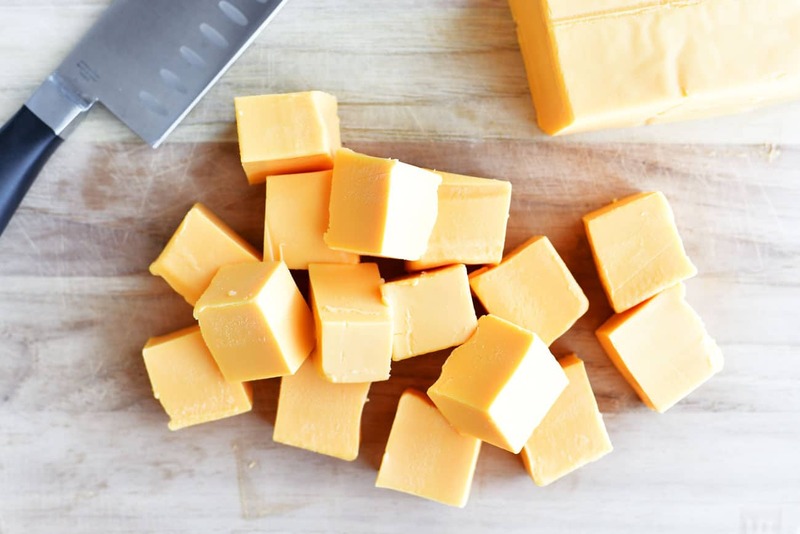 For the cheese in this recipe, I like to use Velveeta because it melts the best and is the easiest method. It doesn’t work very well to add cheddar cheese directly into the crockpot like you can with the Velveeta. It wants to clump together instead of melting. If you want to use cheddar cheese here is how you can do it. Reduce the water in the slow cooker to four cups. When the potatoes are cooked, shred 4 cups of cheddar cheese. (I suggest shredding the cheese yourself because it will melt better). Heat 2 cups of milk in a saucepan until it just starts to bubble. 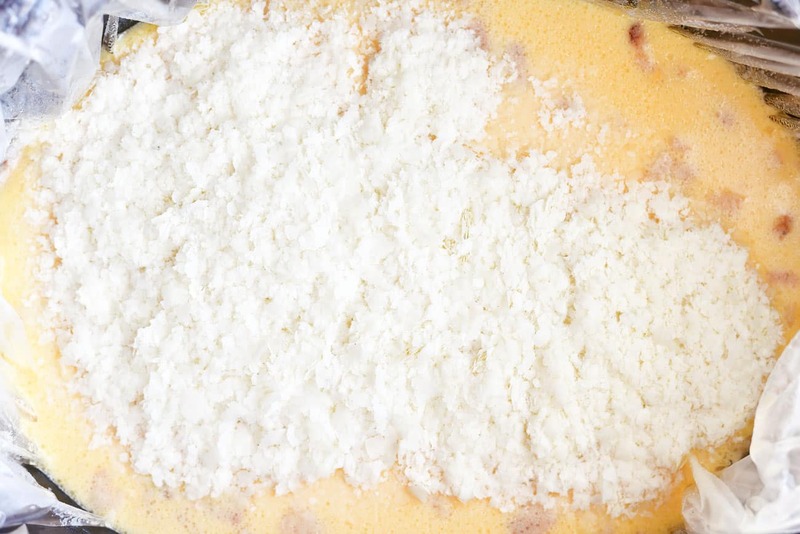 Slowly add the cheese about 1/4 cup at a time, whisking until smooth. Once all of the shredded cheddar cheese has been added, stir the cheese sauce into the ham and cheese soup in the slow cooker. Put the cheese in the crockpot and stir until melted. My mom taught me a great hack for thickening soup: instant mashed potatoes! If you want your ham and cheese soup to be thicker, stir in a cup of instant mashed potato flakes. Pour the soup into bowls, grab a couple of dinner rolls and enjoy! 1. 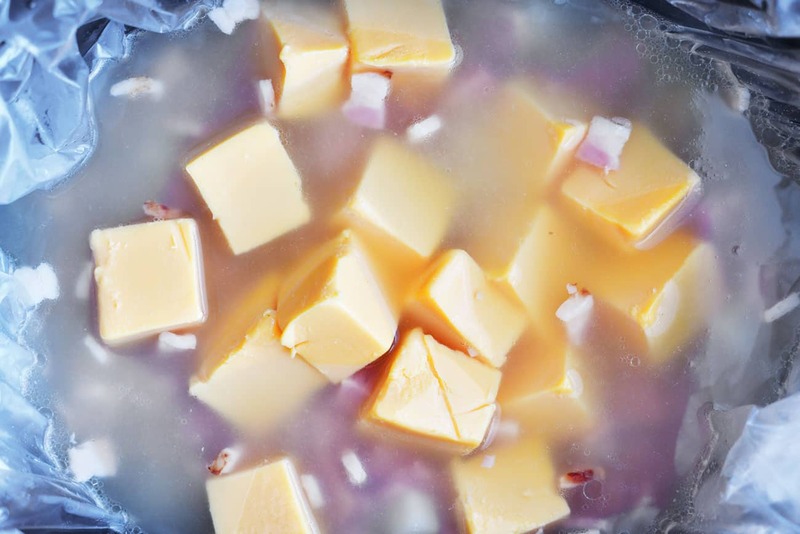 Do you have a low carb or keto ham and cheese soup recipe? 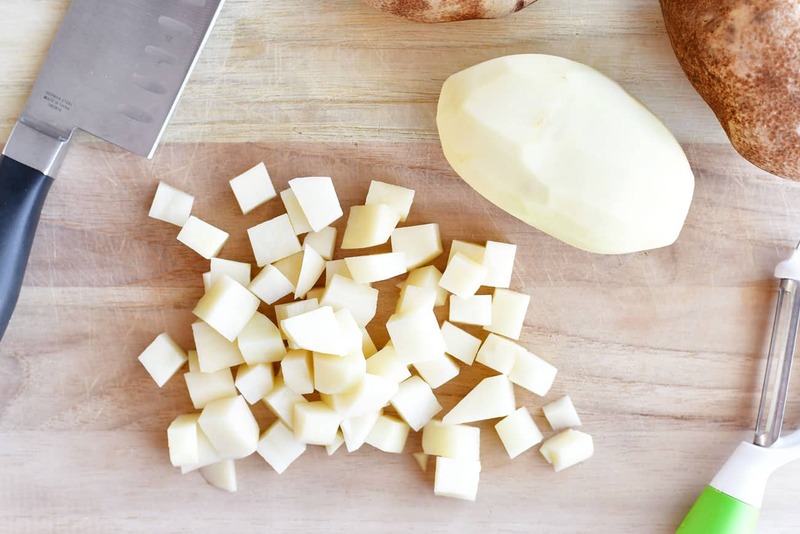 You can make this recipe keto be using cut up cauliflower instead of cubed potatoes. 2. Is this recipe gluten-free? Yes, but always check your labels to be sure. 3. Would it work to add more veggies to this soup? Definitely! Try adding corn, broccoli, and cauliflower. 4. 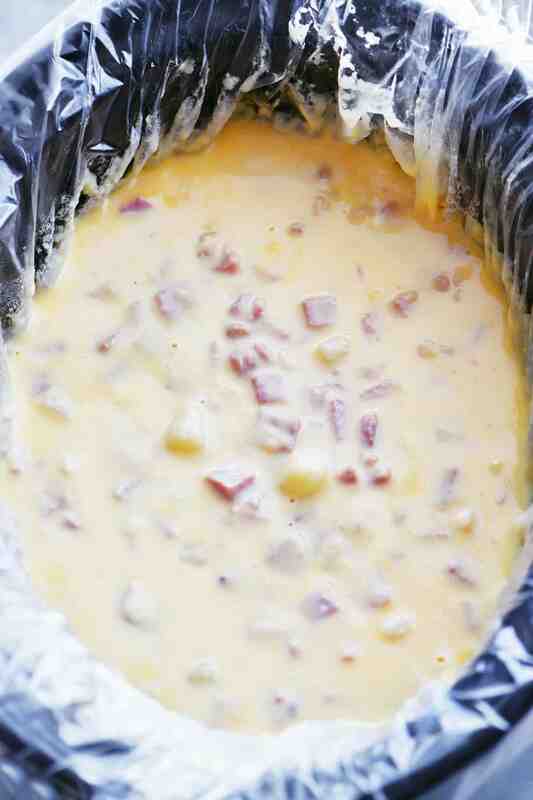 Can you freeze leftover ham and cheese soup? Yes. Once the soup has cooled put it into an airtight container and store in the freezer. 5. How can I make ham and cheese soup on the stovetop? Instead of putting the potatoes, ham, and water in a slow cooker, put them in a large stockpot. Boil until the potatoes are tender. Turn down the heat and stir in the Velveeta. This Slow Cooker Taco Soup recipe is so easy to make and so flavorful. Just brown the meat, put everything in the crockpot to cook, and then just stir! Serve with corn chips. Serve for a family dinner or at potlucks and parties. Slow Cooker Chicken Pot Pie Soup is a fun twist on the classic! Serve it with puff pastry breadsticks instead of pie crust! This Creamy Italian Slow Cooker Chicken Noodle Soup from The Recipe Rebel with garlic, spinach, roasted red pepper and a touch of cream and Parmesan it is hearty and flavorful! Slow Cooker Corn Chowder recipe with potatoes and ham is the perfect comfort food for dinner! It will be a family favorite. 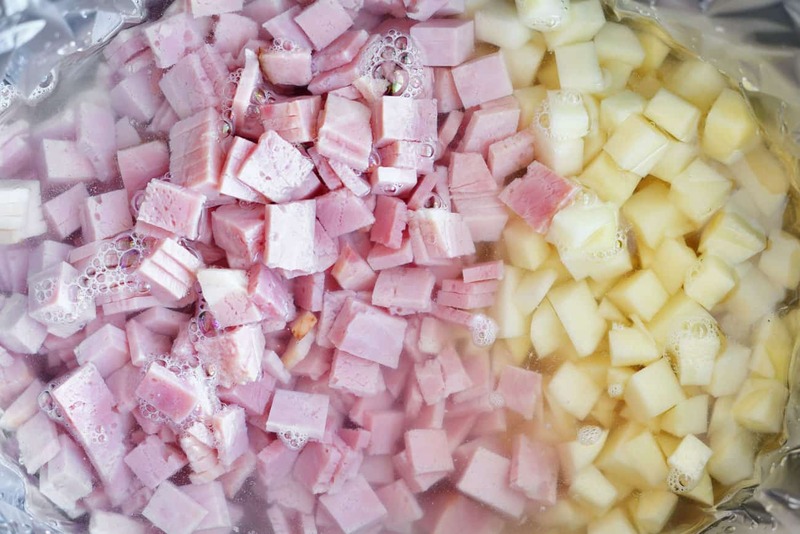 Put the ham, potatoes, and water in a slow cooker and stir to combine. Cover and cook on low for 3-4 hours or high for 6-8 hours until the potatoes are tender. Remove the lid and add the Velveeta. Stir until all of the cheese has melted. To thicken the soup, stir in instant potato flakes. *See blog post for instructions on how to use shredded cheddar cheese instead of Velveeta. This looks so good. 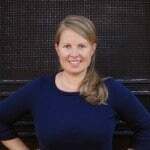 I loved your slow cooker corn chowder recipe. This looks so yummy and you take amazing pics! Lord Almighty!!! This soup looks like it’s TO DIE for!! I’m a soup freak, no matter the season 🙂 I WILL be trying this! SO glad you shared this! This looks perfect!! I never tried soup with cheese and I am sure I will love it! I have been in the mood for soups too! I think it’s a combination of all of this rain/dreary weather and knowing that it’s September! I could’ve done with this a couple of weeks ago Tonia. It’s already warming up nicely. I am in the mood for soup too! This looks pretty simple too!